Dave Ramsey has become a well known name, mostly due to his syndicated radio show I believe. Nevertheless, I have been unfamiliar with him until the past several months. 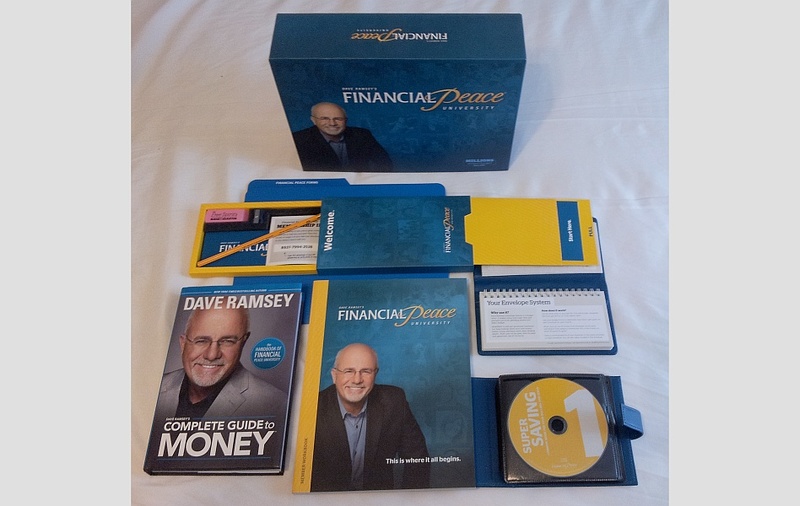 As you can see from the picture, quite a lot of items are included in the package for Financial Peace University (FPU). One of these is the book, “Dave Ramsey’s Complete Guide to Money”. FPU is a nine week course consisting of an hour or so long video and a subsequent small group discussion of similar length. The FPU kit also includes a workbook with a chapter to accompany each session and home work to do each week. Those enrolled in the course also have access to the FPU website which contains related resources (and which is well design I must add). One of the assignments most sessions is to read an accompanying chapter in the book. I discovered the first week that chapters in the book match the video very closely, often even using the same stories. There are however a few chapters in the book which aren’t really covered in the video sessions. As I understand it, Ramsey began financial counseling with people who were facing bankruptcy. After a while he expanded it to others who were in financial trouble, even if not as seriously. The course is still geared for this type of person/couple. Dave has a very dominate personality. He often raises his voice to a yell during his videos, and he is very adamant, “Just do what I say and I guarantee it will work every time in every case.” This is probably good for his target group. On the other hand, there are plenty of people who haven’t gone about things just the way Ramsey instructs but who are in good shape financially. The primary problem which Ramsey addresses is how some people (the impression from taking the course is that this includes most people, though I don’t know if that is an accurate impression) make poor choices in spending their money and/or don’t really even pay attention to how they spend. In the latter case, this person often don’t know where the money is going and why they seem to be financially squeezed. My impression is that Ramsey is best known for helping people get out of debt—debt which they’ve accumulated for these reasons. Therefore, the primary thing Ramsey targets is people’s behavior. He is attempting to get people to think about their money, make a plan for how to use their money wisely, and then follow through on this plan. If you are someone who doesn’t struggle with spending, you will get less benefit from FPU. Even so, there is a wealth of information in the course and book such that almost anyone can probably learn something. Though Ramsey is primarily known for helping people get out of debt and control their spending, each week covers a different, helpful topic, including such topics as insurance, investing, buying and selling a house, and giving. One group which may likely find FPU to be frustrating is those who are unemployed or have a low income for other reasons. Ramsey focuses almost one hundred percent on spending, and not on income. There is a chapter on income in the book but not a corresponding video lesson. In the book, while Ramsey recognizes that income is half the equation, he basically assumes anyone can just go out and get a job; he doesn’t seem to take challenges in employment very seriously. Ramsey does occasionally throw a bone to people in this category. The first “baby step” is to save $1000, but he cuts that in half for those with a lower income. But despite these occasional nods, the great majority of the time he states that if you’re experiencing financial challenges, it’s only because you’re being stupid. Beyond this, Ramsey seems to more or less assume everyone has at least a middle-class income. In the course of FPU a person/couple is expected to save up an emergency fund, pay down their debt, pay for various types of insurance, save up for retirement, save for a “sinking fund”, perhaps save up for their children’s college, and give charitably, all while paying for present living expenses (of course). This sounds challenging to me even for someone who has a fairly good income. Those who have a low income for whatever reason are likely to find Ramsey quite frustrating—and fairly so—even though they can learn some important skills and information. Ramsey talks about FPU being biblical. I think it is in the sense that the Bible instructs us to be wise with our resources and gives certain teachings on what that looks like. For some then, especially the primary target demographic, handling money more wisely seems a reasonable step God would want them to take. Ramsey does talk about certain values such as being generous and not hoarding in his final lesson on giving. Beyond this though, FPU isn’t really spiritual—more practical. That’s not to say it’s bad; we have to take care of the practical matters in our lives. But beyond being more responsible with one’s money, FPU won’t really teach a person to be more Godly. That type of teaching and growth will need to come from elsewhere. In summary, FPU and “Dave Ramsey’s Complete Guide to Money” will be particularly helpful for those who have a decent income but aren’t wise in how they spend—if they follow Ramsey’s instructions. I would particularly recommend it for these people. Others will find useful information and tips. For those who have a decent income but already handle their money fairly wisely, I would probably recommend simply reading the book; the full course may be overkill. Those who have low income can also learn from the course, but it likely will be a frustrating journey and won’t necessarily help with their greatest need: increased income.